This condiment, made with green tomatoes, apples, and onion, has a nice balance of sweet and tangy. Use it as a sandwich topper or serve with grilled meats. With a large food processor fitted with a shredding blade, shred the tomatoes, apples, peppers, and onion. In a 4-quart Dutch oven combine sugar, vinegar, salt, black pepper, and spices. Cook and stir until sugar is dissolved; add shredded tomato mixture. Bring to boiling. Reduce heat and simmer, uncovered, about 30 minutes or until reduced to about 5 cups. Cool slightly; transfer to jars or freezer containers. Cover and chill to store, or label and freeze for up to 3 months. Thaw to serve. 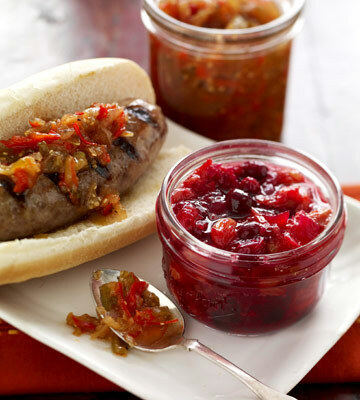 Serve as a condiment with hot dogs or hamburgers. Makes 5 cups. Test Kitchen Tip: Mixture is acidic enough that it can be packed in sterilized half-pint jars and processed in a boiling-water canner for 10 minutes.